Camping season is just around the corner! When we think of camping we think of burgers, chips, pop and s’mores. While those are tasty treats, they’re usually packed with sugar, sodium (salt) and calories. There are many healthy and delicious alternatives to a hot dog on a stick! Meals and snacks should help fuel your outdoor activities like hiking, hunting, fishing, and games. With a bit of planning, a cooler, and some aluminum foil, you can create delicious and healthy meals for your next camping adventure! A staple breakfast that’s usually not so easy to pack. Before you leave, crack as many eggs as needed into an empty glass jar to avoid eggs cracking in your bag. This will save you on clean up, messy accidents and can stay cold in a cooler bag. 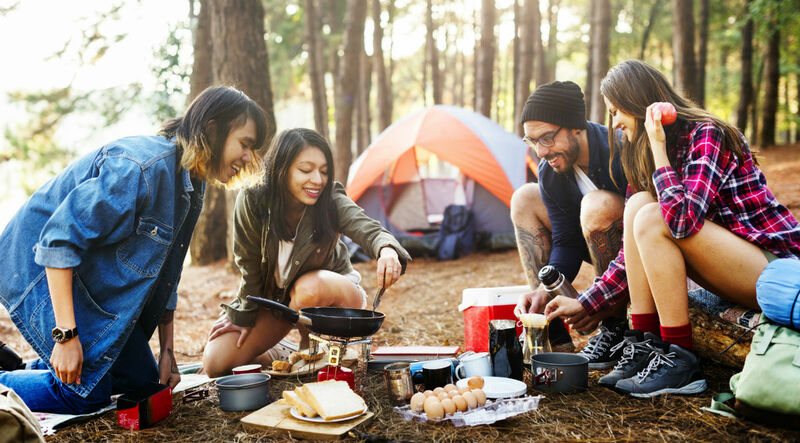 Eggs and toast can be easily cooked in a pan over a campfire or using a camping barbecue. Delicious and easy to make and pack! Grab some whole wheat pitas or whole wheat tortillas, spread on your favorite hummus, and add carrot, celery, and red peppers cut up into sticks. This is an easy prepared lunch that is full of fiber and protein. Health Happy Tip: Add peanut butter and raisins to your bannock for protein and fiber. Fish is full of healthy fat and high-quality protein. Pick your favorite fish like walleye, salmon or cod; or catch it yourself! It doesn’t get any easier than this! Wrap the ingredients for each side in tinfoil then place on the grill or pan over the fire. Add spices to the sides to cut down on salt and to add flavor! Shake the foil every few minutes to avoid burning your vegetables.